Today the Chancery staff took Lydia Firman to a local restaurant to have a final lunch of memories and best wishes as they bid her farewell. She submitted her resignation some time ago, but today, June 1, 2017, was her last day on the job. For the last number of years she served as the chancery receptionist. However, prior to that she worked in the Religious Education Centre and with the staff of the weekly Catholic Newspaper – Progress-Поступ. The restaurant they chose was the Casa Romana Banquet Hall on Main Street. They enjoyed an excellent buffet that included Romanian specialties. The dessert was a traditional Romania papanaş (pronounced папанеш) which left everyone speechless. 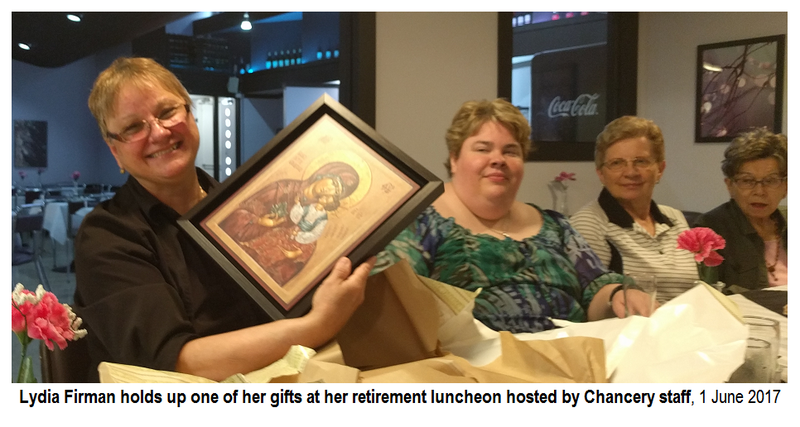 Metropolitan Lawrence presented Lydia with gifts from the Chancery and staff that included the beautiful icon Mother of God of Canada written by iconographer Vera Lazarowich Senchuk. Many jokes and memories were shared. Fr. Michael wished her well and intoned a “mnohaya lita”. 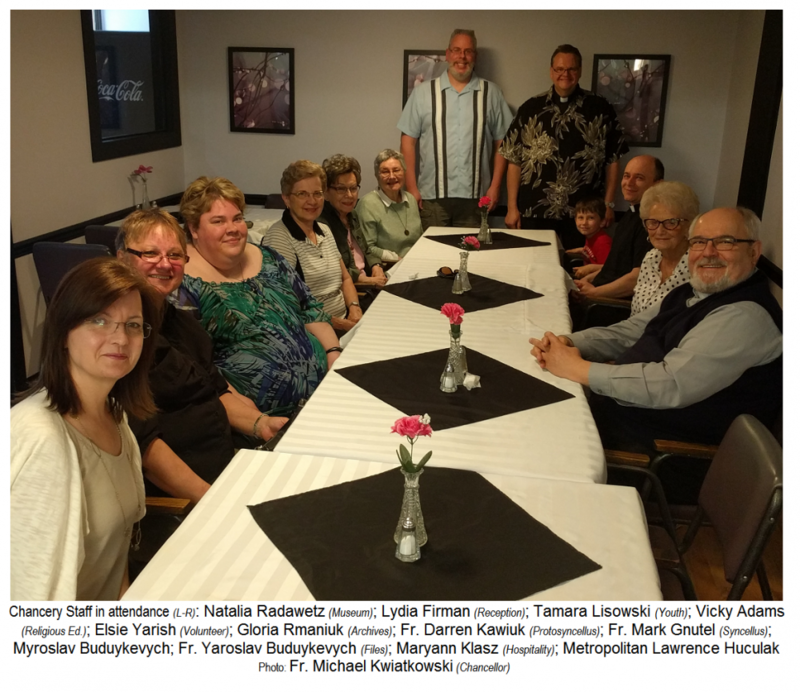 Besides her days at the Chancery, Lydia has been active in the wider church community as a parsihioner of Holy Eucharist Parish, president of the Ukrainian Catholic Women's League, volunteer and organizer or various events like the National Day of Prayer for peace. Her first post-retirement plans include a trip to family in Victoria, B.C. and later to visit her son Hierodeacon Paisy at a Monastery in the United States. God bless Lydia for her many years of service in the Church and, God willing, for many more in new ways!